Cllr Michael O'Meara launched his 4th consecutive election campaign recently in Lorrha GAA clubhouse. 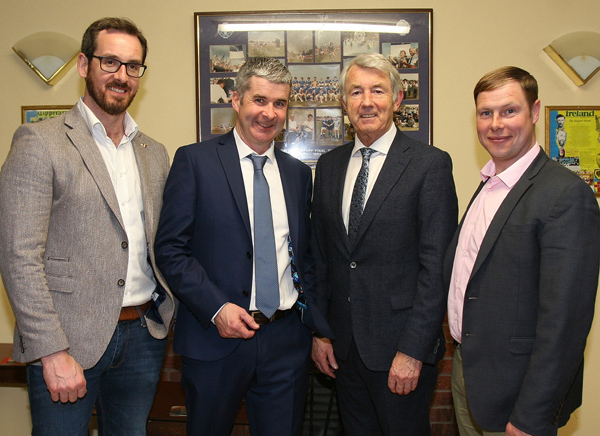 Michael is pictured here with Deputy Michael Lowry TD, Micheál Lowry and Shane Lee during the launch. 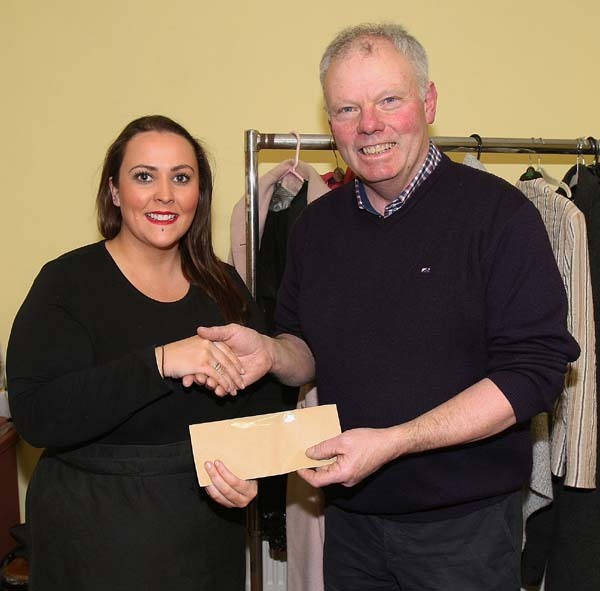 The results from the North Tipp Ploughing fundraising draw which was held recently was. 1st prize of €300 was won by Denis Lee, Cratloe. Co. Clare, 2nd of €200 was won by Mary Flynn Rodeen, Borrisokane, 3rd. of €100 went to Danny Burke, Kilbarron and the 4th prize of two tickets to a day at the National ploughing championships next September went to Marie Kennedy, Moatfield, Lorrha. There were numerous small prizes given out on the night. The committee wish to thank everyone who bought and sold tickets, to all who donated spot prizes and to Joe and Jane Hannigan for hosting the event. 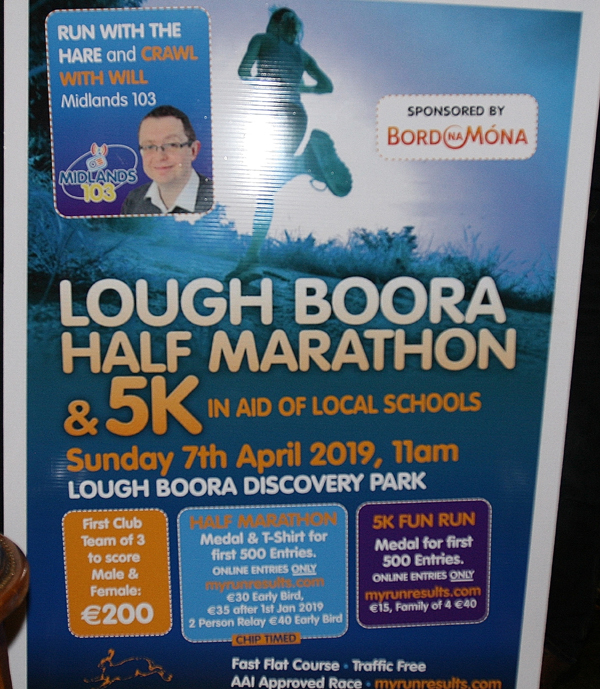 Please Note that all details of Mass times, dates and contact numbers are detailed on the parish web site www.lorrhadorrha.ie under local info and Churches. Holy Thursday: - 18th April: Mass of the Lord’s Supper - Rathcabbin Church at 7.00p.m. Good Friday: - 19th April is a day of fast and abstinence. 5.00p.m. Liturgy of the Passion & Death of Christ in Rathcabbin Church. 8.30p.m. Prayer around the Cross in Redwood Church. Holy Saturday: - 20th April: 9.00p.m. Easter Vigil in Lorrha Church. Easter Sunday: - 21st April: 11.30a.m. Mass in Rathcabbin Church. This will be held on the 8th May 2019 at 8.30 pm Rathcabbin Hall. Forms are being distributed to volunteers and meeting attendees to nominate committee members. If you are an interested resident and have not received a form, please collect one in Kellys Shop and return it by 23 April 2019. When cleaning out your wardrobe to make room for the new collection, please remember Lorrha Development/Tidy Towns who continue to collect unwanted clothes throughout the year. Items of clothing must be clean and dry and in good condition please and we can supply bags if you want. We can also collect to make it easy for you, just call (086) 8647166, (086) 8493595 or (087) 2601413 with your name and details. Please note we cannot accept Duvets, bedding, household linen, pillows, cushions, carpets, rugs and mats including bath toilet and shower mats soiled or wet clothing but good quality unwanted clothing for re-use (not recycling). All money raised from all fundraising ventures is used for the ongoing work around Lorrha Village. Many thanks for your continued support. Aglish Sociable Ladies are holding a family Fun Run walk or crawl 5k or 10k on Sunday 28th April. Registration from 10.30am in Aglish Hall. 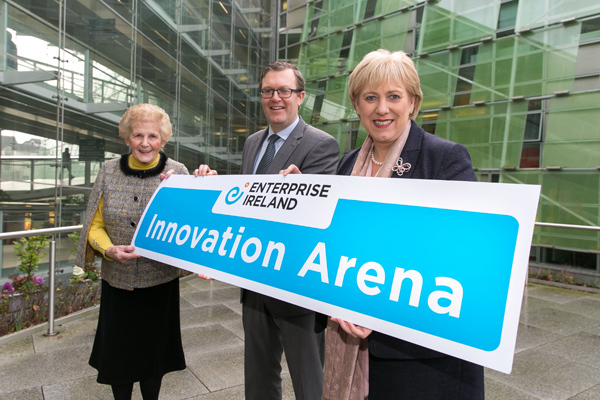 €10 per entry – children free. Event starting at 12 noon. All proceeds to North Tipp Hospice and Suaimhneas. Please support. The group are also holding a monster raffle with great prizes up for grabs such as week-ends away, hampers and numerous other prizes. Tickets available from any member of the committee. Congratulations and many good wishes are extended to Kevin and Mary Barry Portland on the occasion of their 50th wedding anniversary. Kevin and Mary celebrated the lovely occasion last week-end with their family. Well done to you both. Portumna library is hosting a children's art exhibition of creations by the students of Ute Duggan "Bramble Art" Lorrha, from April 13th - 26th. The exhibition will open on Saturday coming the 13th at 3pm. All welcome. North Tipperary IFA, Teagasc and Maxol have teamed up to host a farm safety event with a difference. On Wednesday, April 17, from 12-4 pm, the Moran family farm at Coorevin, Borrisokane, is hosting the event with many aspects to the day. This is a Teagasc KT event and all are welcome. Mass will be celebrated in Lorrha Church on Saturday 13th April at 6.30pm and in Rathcabbin the following day at 11.30am. Mass in Lorrha Church on Mondays at 9.30a.m. Adoration of the Blessed Sacrament on Thursdays from 10.00am to 8.00pm. in Rathcabbin Church. Choir Practice in preparation for Holy Week and Easter on Wednesday 10th April at 8.30pm. All welcome. The monthly St. Padre Pio Mass will be celebrated this month on Thursday April 11th (because the following week is Holy Thursday), at St. Brendan’s Church, Birr. Rosary at 7.00 with Mass at 7.30pm. All welcome. 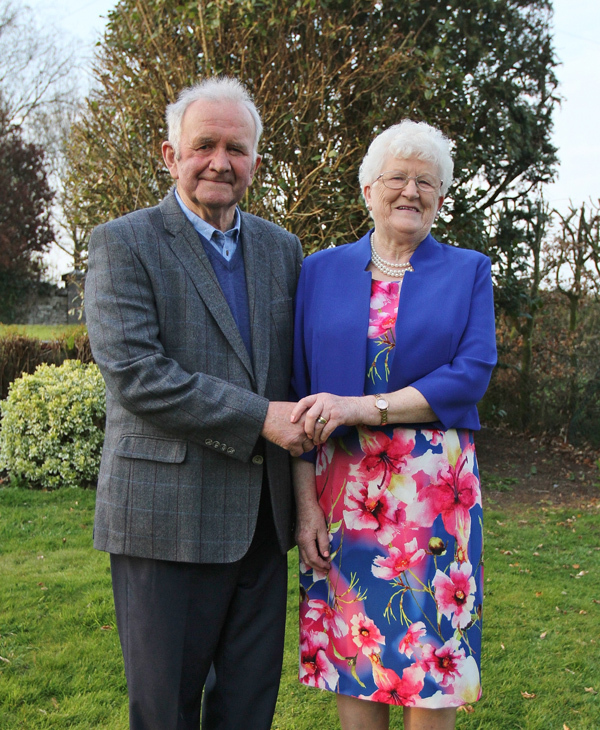 Rathcabbin Couple Reap All Ireland Results. A coaching husband and wife team at the Midlands Gymnastics club in Nenagh and Rathcabbin couple Andrei and Natasha Chukai are delighted to announce that they have had super results from the National All Around Artistic Competition which was held in the National Indoor Arena recently. Midlands Gymnastics club which is based in Unit 4, Castlebrand, Tyone, Nenagh have been making their mark in the Gymnastics world since they formed in recent years but so far, this year has been their best with the club having 19 girls in total competing in Level 1, Level 4 and Level 5. The clubs U8 and U9 team’s brought back Gold Medals while a silver medal went to Faye McKeogh in the U10 competition. The club wish to thank all the children who participated and everyone who supports the Midlands club. A Wake in the West. The play is set during the wake of Tom Healy who has drunk himself to death and now wishes his grave to be a watery one by requesting cremation and the scattering of his ashes at sea. The comedy begins when the family doctor informs his siblings of their father’s strange request. This hilarious play has sold out venues all over Ireland. Irish music legends, The Fureys, renowned for their hit songs ‘When you were sweet 16’, ‘The Green fields of France’, and ‘From Clare to here’, will update and relaunch their song ‘Our Games’ ahead of the GAA All Ireland 2019 on Friday the 26th April. Proceeds from the downloads will go to CMRF Crumlin who raise vital funds for Crumlin Hospital and the National Children’s Research Centre (NCRC). CMRF Crumlin thank the late Brendan O’Reilly’s wife Johanna Lowry O’Reilly who generously waived all royalties for the recording, Ceol Music who have waived all downloading fees, Abby Dillon from Littlebird Design who created the design of the promotional CD without charge and All Write Media who sponsored and manufactured 300 promotional CDs. There was No Winner of this weeks lotto jackpot of €10,800. Numbers drawn were: 9-12-30-31. 1 Match 3 wins €100: Brian Kennedy. Next Monday's draw will be for a jackpot of €10,950 with a Match 3 pot of €100 so make sure you are in the draw. Thank you for your continued support. Senior Hurling: The senior hurlers came from six points down to earn what could be a valuable 1-13 to 0-16 draw with Thurles Sarsfields in the opening round of the O Riain Cup in Nenagh on Sunday, with Cian Hogan getting an injury time goal to claim a vital point. Lorrha's next competitive game will be away to Newport in round 3 of division 2 of the County League on the weekend of 27-28 April. Junior Hurling: Lorrha have a bye in round 3 with their next game on 27th April at home to Portroe. Junior Football: Lorrha are taking part in the new all-county Junior 'B' Football Championship and will play Nenagh Eire Og in the first round over Easter weekend. Minor Hurling: Lorrha Rovers Gaels got off to a winning start in the new Minor Hurling League last Thursday when they defeated Ballinahinch/Templederry 4-10 to 0-10 in Ballinderry. This Wednesday, 10th April, they take on Portroe in Portroe at 6.30pm. Under 16: Lorrha Rovers Gaels have been graded 'B' for this years championship and began away to Borrisokane on Sunday last and earned a hard fought 1-5 to 1-3 win. Next Monday, they play Toomevara in Moatfield at 7.00pm. Under 14: The football championship begins on Thursday 11th April at home to Silvermines at 6.30pm. Under 12: The footballers played Moneygall on Tuesday week last in round 2 of the North championship and were defeated. On Saturday, they hosted Newport in Moatfield and were also defeated. They played Toomevara last evening (Tuesday), no result at the time of going to press. Next Tuesday, 16th April they play Kiladangan in Moatfield at 7.00pm. Tipperary GAA Clubs Draw: Thanks to all our subscribers for the 2018/2019 draw which has now concluded. We ask all promoters are asked to bring their accounts up to date ahead of the new draw which we will be promoting in the coming weeks. Social Dancing: in the GAA Centre on Friday 12th April with Mary Prendergast. Dancing 9.30pm to 12.30am. Members of Midlands Gymnastics Club enjoyed success at the GymSTART Level 1 competition in the National Sports Arena in Dublin on March 10th. 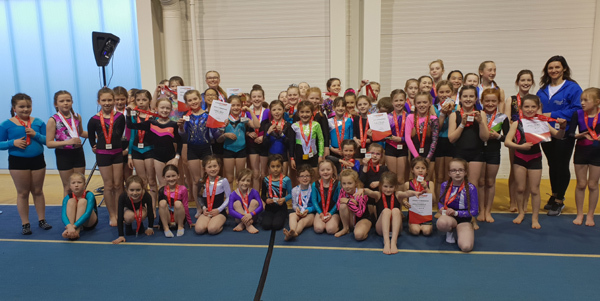 57 of our recreational gymnasts took part in the competition bringing home many gold, silver and bronze medals. We are very proud of all our gymnasts and the great work they have put into their training. It is great to see all their hard work and dedication paying off. Also a big thanks to their parents for their continued support and encouragement. It is great to see our local club putting its name on the map. Well done to all! The new Rags season kicks off on Saturday April 6th in Portumna Gold club. Tee off at 10.30am. New members welcome. The deferred date for the North Tipperary ploughing raffle is this coming Saturday night April 6th in Hannigan’s Kilbarron. Tickets are still on sale and may be had from all members. 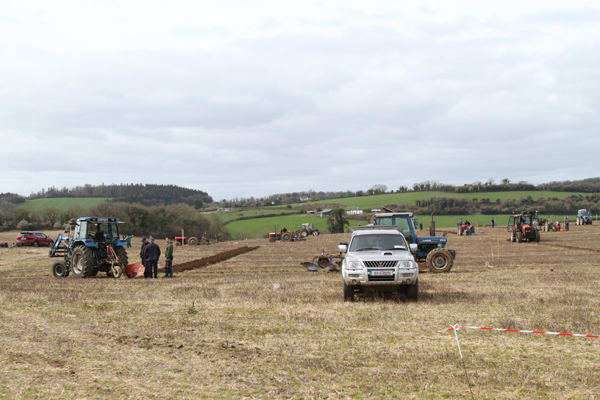 The results from the recent North Tipp Ploughing Championships are as follows. Reversible: 1st Joe Slattery, 2nd Jimmy Ryan, 3rd John Cahalan. Conventional: Senior 1: 1st Larry Bergin, 2nd Johnathan Murray,3rd John Slattery. Senior 2: 1st Liam Hammilton, 2nd Tom Duffy, 3rd Noel Howley. Under 28: 1st Lorcan Bergin, 2nd Liam Murphy, 3rd Mac-Darragh Kennedy. Vintage 2 Furrow Mounted: 1st Ethan Harding, 2nd Ray Clancy,3rd Paddy Doyle. Single Furrow: 1st James Hough, 2nd Andrew Hogan. Vintage Trailer: 1st Tommy Pierce, 2nd Aeneas Horan, 3rd David Gratton. Vintage Classic: 1st Timmy Horan, 2nd Trevor Hogan, 3rd Francis Worrell. Three Furrow: 1st Ciaran Milne, 2nd Tom Ryan, 3rd Eddie Hannon. Mass will be celebrated in Redwood Church on Saturday 6th April at 6.30pm and in Rathcabbin the following day at 11.30am. Mass in Lorrha Church on Mondays at 9.30a.m. Please Note: First Friday Mass on Friday, 5th April will be in Lorrha Church at 7.30p.m. Congratulations to Clodagh McIntyre and the Tipperary minor team who beat Galway on Saturday last in the fourth and last round of the championship. Tipp are now through to the All Ireland semi finals. Watch this space for further details. Congratulations to Colm Fogarty, son of Dympna and Willie, Lorrha who played his part in helping his school Borrisokane Community College to the All Ireland Senior 'C' Hurling title defeating Colaiste na Coiribe from Galway in the final which was held in Ballinasloe. A young hurler to watch in the future. Well done Colm. There was No Winner of this weeks lotto jackpot of €10,650. Numbers drawn: 1-7-22-26. 3 Match 3's share €100: Oliver Feighery, Kenneth Cleary and Joan Lynskey. Next Monday's draw will be for a jackpot of €10,800 with a Match 3 pot of €100 so make sure you are in the draw. Thank you for your continued support. Senior Hurling: Lorrha are in county championship action next Sunday in the first round of the Seamus O Riain Cup against Thurles Sarsfields in Nenagh at 2.00pm. Your support would be appreciated. Junior Hurling: The junior hurlers bounced back from their opening round loss to defeat Borrisokane 2-5 to 0-15 in Moatfield in the North Junior 'B' Hurling League on Saturday. Lorrha have a bye in round 3 with their next game on 20th April at home to Portroe. Minor: Lorrha Rovers Gaels will take part in the new North Minor Hurling Development League which gets underway on Thursday 4th April against Ballinahinch/Templederry at 6.30pm in Ballinderry. This competition will be played without county minors/exam students were possible with team numbers being flexible depending on opposition numbers. Under 16: Lorrha Rovers Gaels have been graded 'B' for this years championship which begins away to Borrisokane on Monday 8th April at 6.30pm. Under 12: The footballers suffered a heavy loss to Silvermines in the opening round of the North 'B' Championship on Saturday. They played Moneygall on Tuesday evening and were also defeated. Next Saturday, they host Newport in Moatfield at 3.00pm while next Tuesday 9th April, they travel to Toomevara for a 7.00pm start. Membership: The closing date for membership passed on Sunday 31st March last. Thanks to all who have become members for the year, your support is greatly appreciated. Only those paid up on that date will be able to access to tickets should Tipperary reach the All Ireland Final. Only paid up members can vote at this years AGM. Sponsorship: The club would like to thank David Fogarty of House Fitness Birr for sponsoring training gear for the senior & junior hurlers for the coming year. The training tops contain the logo and contact details of suicide prevention charity Pieta House as per the sponsors request. Social Dancing: in the GAA Centre on Friday 5th April with Checkers. Dancing 9.30pm to 12.30am. 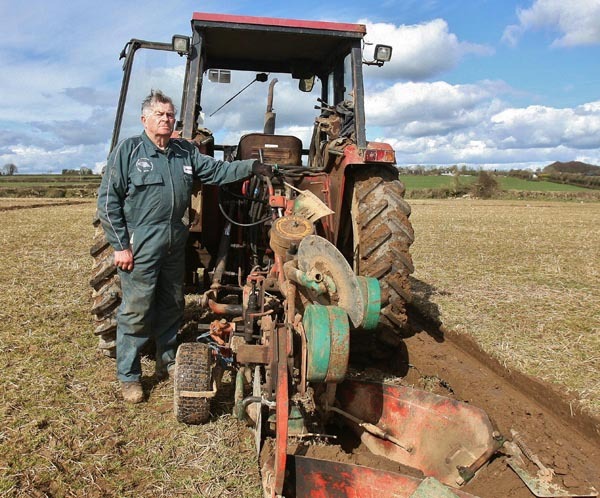 After two unsuccessful attempts to hold the North Tipperary Ploughing Championships the event went ahead on the third occasion on Saturday last March 23rd on the lands of the Dennison family Kilbarron by kind permission. The weather was ideal, the ploughing was perfect and the turn out was wonderful. All in all it was a great day. Rags Golfing Society.The new Rags season kicks off on Saturday April 6th in Portumna Gold club. Tee off at 10.30am. New members welcome. The North Tipperary ploughing raffle has been deferred to Saturday night April 6th in Hannigan’s Kilbarron. Tickets are still on sale and may be had from all members. The Championships took place on Saturday last at the third attempt. Both the weather and the conditions were superb and many thanks is extended to the Dennison family for hosting the event. Watch this space for details of the competition next week. "I would like to thank everyone who supported my table quiz last Friday night in The Ferry Inn, through attending, buying raffle tickets, donating prizes and sponsorship. There was a massive turnout on the night, which I am really grateful for. We raised an amazing €2,000 for UCDVO on the night, which will go directly to the project in Tamil Nadu, South India. Special thanks to Theresa and Barry and staff, for hosting the quiz and all the hard work they put in making it such a brilliant night. George Harding"
Sympathy is extended to the Donoghue families Lorrha on the death of Eugene Donoghue Dublin and late of Lorrha. Cremation took place in Daristown Crematorium after funeral Mass on Wednesday March 20th. May he rest in peace. Mass will be celebrated in Lorrha Church on Saturday March 30th at 6.30pm and in Rathcabbin the following day at 11.30am. Mass in Lorrha Church on Mondays at 9.30a.m. The best of luck is extended to Clodagh McIntyre Lorrha and the Tipperary Minor camogie when they take on Galway on Saturday next the 30th. The sociable ladies committee in Aglish are very busy organising the following activities. They are running a ceramics class on April 10th and on April 28th they have a fun walk/run. On May 15th they are holding a BBQ demonstration in Gurteen College while on June 1st they are going on a trip to Blooms in Dublin. There are still some places left on the bus. They finish off then with a raffle and a BBQ in Aglish on June 15th. 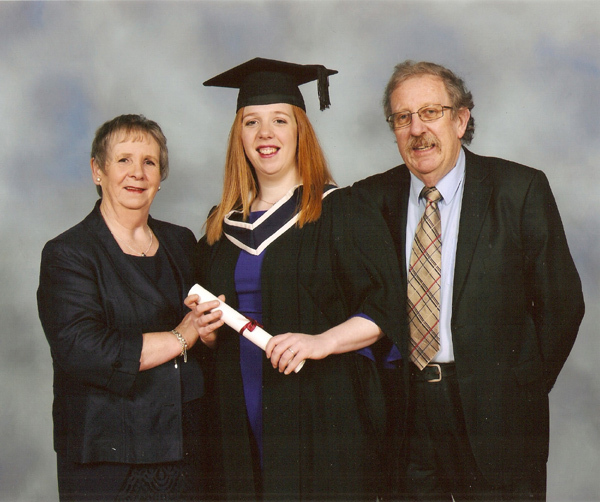 Many Congratulations are extended to Catherine Power, daughter of Jacinta and David, Lorrha who graduated from Athlone IT with a Honours Bachelor Degree in Business & Law. A former Deputy President of Athlone Institute of Technology Student's Union, Catherine is presently working in the banking sector in Limerick. Well done Catherine and all the best in the future. Due to the heavy rain last Friday night/Saturday morning the North Tipp ploughing championships had to be postponed once again. However, with time running out for the completion of the championships, the committee in charge will endeavour to hold the competition on Saturday coming March 23rd at 12.30am in Kilbarron and hopefully the weather will be favorable for this third attempt which hopefully will be third time lucky. Later that night the ploughing draw for the raffle will take place in Hannigans with three cash prizes up for grabs along with numerous other prizes. Mass will be celebrated in Lorrha Church on Saturday March 23rd at 6.30pm and in Rathcabbin the following day at 11.30am. Mass in Lorrha Church on Mondays at 9.30a.m. Gardai are appealing to dog owners to lock up their dog’s and make sure they are not straying and worrying or killing sheep and lambs. IFA national sheep chairman Sean Dennehy said the family pet can turn into a marauding killer and cause savagery and mayhem on a defenceless sheep flock. 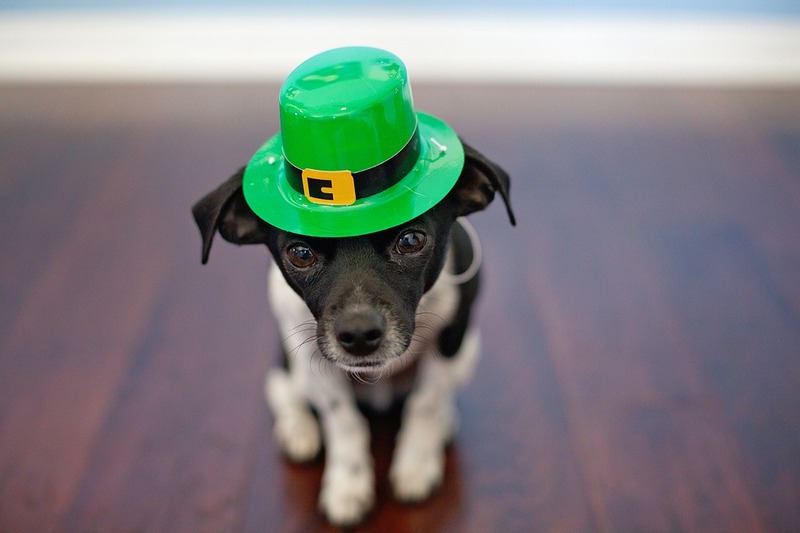 “People who take dogs as pets have to take on the responsibility that goes with that. If dog owners saw the destruction from an attack, they would have a very different mindset. Unfortunately, there are too many people who casually take on a family pet, particularly for Christmas, but they are not prepared to devote the time to responsible dog ownership. Dog owners can be held responsible for any losses from attacks on sheep, with serious financial and legal consequences. Farmers have a right to protect their sheep flock and can shoot a dog worrying, or about to worry, their flock’ he said. So all dog owners note that you are to keep your dog under control. Running free, he can be a killer. 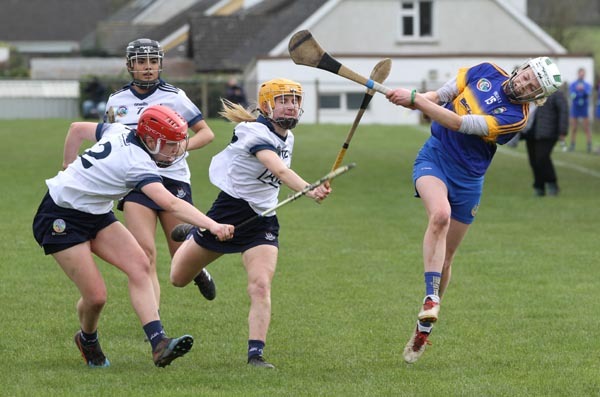 Congratulations is extended to Clodagh McIntyre Lorrha and the Tipperary Minor camogie team who beat Wexford on Saturday last in the third round of the championship. The girls top their group with three wins out of three played. We wish Clodagh and the team the best of luck in their last outing which is away to Galway on this coming Saturday 23rd. March. Later this year George Harding will travel to Tamil Nadu, Southern India as part of UCD Overseas Volunteering Programme. To raise funds towards this project, a Table Quiz will be held in The Ferry Inn this coming Friday night the 22nd March at 8.30pm. George would be grateful for your support on the night. Employability Service North Tipperary is a employment and recruitment service which supports people with an illness, injury or disability to secure and maintain a job in the open labour market. If you would like to avail of our service please contact us on (087) 9181857. There was No Winner of this weeks lotto jackpot of €10,350. 3 Match 3's share €100: Ita Houlihan, Liz Kennedy, Cormac & Clodagh McGarry. Next Monday's jackpot is €10,500 with €100 Match 3 pot so make sure you are in the draw. Thank you for your continued support. The hurlers recorded their second successive draw in the County Hurling League on Sunday when a late Ballina goal saw the visitors earn a share of the spoils on a 0-17 to 1-14 scoreline. Lorrha's next competitive game will be in the Seamus O Riain Cup first round against Thurles Sarsfields on weekend 6-7 April. Junior Hurling: The North Junior 'B' Hurling League will begin on Saturday 23rdMarch with Lorrha taking on Silvermines in Dolla at 5.00pm. We are also grouped with Borrisokane, Nenagh and Portroe. 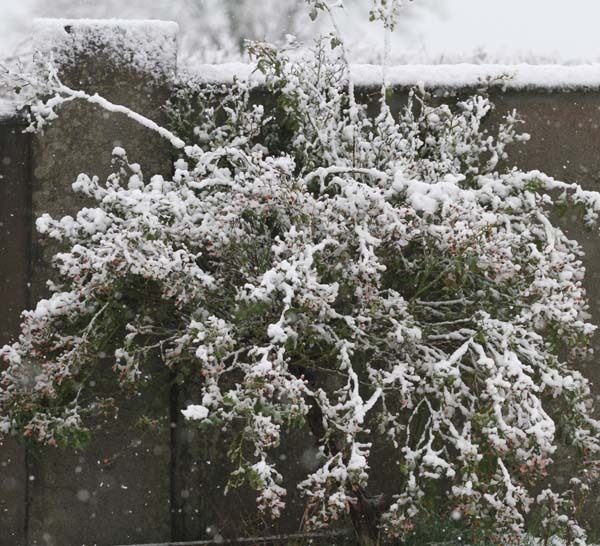 Under 14: The North 'B' Feile semi-final against Moneygall/Clonakenny was postponed on Saturday because of the weather. It was refixed for last Monday and Lorrha won 5-7 to 4-4. Lorrha will play Newport in the final in Toomevara next Saturday 23rd March at 3.00pm. Best of luck to the players and mentors. Camps: Tipperary County Board are looking to recruit coaches for work on Easter and Cul Camp in 2019. Applicants must be aged 17 on or before April 1st. To apply please send a CV with cover letter via email to tipperarygaacamps@gmail.com. Closing date for applicants is Friday 22nd March. Tipperary GAA Clubs Draw: Thanks to all our subscribers and we ask all promoters are asked to bring their accounts up to date as the April draw is the final one of the year. Social Dancing: in the GAA Centre on Friday 22nd March with Twice Shy. Dancing 9.30pm to 12.30am. Clodagh McIntyre in action for Tipperary Minors who beat Dublin to record two wins out of two games played. The North Tipperary ploughing championships re-scheduled date is Sunday March 17th. The time remains the same as before with a 12.30pm start on the lands of the Dennison family Kilbarron by kind permission. Hopefully the sun will make an appearance but most of all, the day will remain dry. Please support. Mass will be celebrated in Redwood Church on Saturday March 16th at 6.30pm and in Rathcabbin the following day at 11.30am. Mass in Lorrha Church on Mondays at 9.30a.m. Congratulations is extended to Clodagh McIntyre Lorrha and the Tipperary Minor camogie team who beat Dublin on Saturday last in the championship. The girls have two wins out of two played and are top of their group. We wish Clodagh and the team the best of luck this coming Saturday 16th when they play Wexford away. Later this year George Harding will travel to Tamil Nadu, Southern India as part of UCD Overseas Volunteering Programme. To raise funds towards this project, a Table Quiz will be held in The Ferry Inn on Friday 22nd March @ 8.30pm. George would be grateful for your support on the night. Congratulations is extended to Noel Lane Roscrea and formally Lords Park, Rathcabbin who graduated from the Garda Training College in Templemore last week. Well done Noel and many good wishes for the future. Rathcabbin Players wish to extend thanks to all who attended and supported this year’s production of ‘Better late than Never’. Thanks to all who gave spot prizes for each night’s performance and to all who bought tickets. A very special word of thanks to the hard working cast members and not forgetting their director Marian Frawley, all who worked behind the scenes and the local press for coverage. A meeting for all members will take place in Rathcabbin Hall on Wednesday night 20th at 9.00pm. There was No Winner of this weeks lotto jackpot of €10,200. 2 Match 3's share €120: Bridget Madden, Tom Milne (London). Promoters: Louise Mannion, Darina Kelly, Mulrooneys Gala. Next Monday's draw will be for a jackpot of €10,350 with a Match 3 pot of €100 so make sure you are in the draw. Thank you for your continued support. Junior Hurling: The junior league will begin on the weekend of 23-24 March, away to Silvermines. We are also grouped with Borrisokane, Nenagh and Portroe. Minor Football: The Lorrha Rovers Gaels minor footbllers exited the championship on Sunday following a 4-11 to 0-6 defeat to Borrisokane in Moatfield on Sunday. The players focus now shifts to hurling and the upcoming minor league. Under 14: Lorrha will play Moneygall/Clonakenny in the semi-final of the North Feile 'B' Hurling competition in Moatfield on Saturday 16th March at 3.00pm. Camps: Tipperary County Board are looking to recruit coaches for work on Easter and Cul Camp in 2019. Applicants must 17 on or before April 1st. To apply please send a CV with cover letter via email to tipperarygaacamps@gmail.com. Closing date for applicants is Friday 22nd March. Tipperary GAA Clubs Draw: The March draw took place last Friday night in Clerihan but the club had no winners this month. Thanks to all our subscribers and we ask all promoters are asked to bring their accounts up to date as the April draw is the final one of the year. Tipperary: Best wishes to Patrick Maher, Brian Hogan and the Tipperary senior hurlers in the National League quarter final against Dublin next weekend. Membership: for 2019 is now due. €90 – Adult player; €50 – Minor/College student; €30 – Non-playing Adult (+€70 extra for gym membership); €20 – Juvenile (16 & under); €90 – Family (2 adults & 2 children, capped at €100 for three or more children). Social Dancing: in the GAA Centre on Friday 15th March with Caitriona O'Sullivan. Dancing 9.30pm to 12.30am. Sunday March 3rd 2019 and most of the country was covered in a blanket of snow resulting in the North Tipp Ploughing Championships having to be cancelled. Rathcabbin Players chairman Ray Kennedy is pictured here presenting a cheque for €1,800 to Fiona Kennedy who travels to Abu Dhabi this month with the Special Olympics. Fiona played the part of Imelds Crotty the waitress in this year’s production of ‘Better Late Than Never’. Due to the bad weather, the North Tipp Ploughing championships scheduled to take place on Sunday last the 3rd in Kilbarron, had to be cancelled. A meeting will take place this Wednesday night 6th in The Yanks Borrisokane at 9.00pm to re-arrange a suitable date. All members are requested to attend. The next Mass in the ‘Do This in Memory’ programme for children receiving the sacraments of Communion and Confirmation, will take place in Rathcabbin Church on Sunday March 10th at 11.30am. First Communion will take place on Sunday 19th May in Lorrha. Confirmation will take place in Rathcabbin on Friday 24th May. We continue to do our bit for the environment as the students perform their daily reduce, reuse and recycle. Next month we will be joining up with Lorrha Development/Tidy Towns for our annual spring clean litter pick. Many thanks to all the parents for bringing in their used batteries and used postage stamps. Keep them coming please. We are also accepting used fence batteries so any farmer out there who wishes to dispose of old fence batteries, please bring them along to us during school opening times. Mass will be celebrated in Lorrha Church on Saturday March 9th at 6.30pm and in Rathcabbin the following day at 11.30am. Mass in Lorrha Church on Mondays at 9.30a.m. Rosary will be recited before Vigil Mass and Sunday Mass during the season of Lent. Please note, when making a booking for Anniversary/ Month’s Mind Mass, Wedding, Christening etc. you can contact the parish office by phone – 090 9747009 and leave a message or E Mail: lorrhaparishoffice @ gmail.com (preferred options), you can also make bookings after Masses on Sundays or phone parish office on Wednesday nights 8.00 to 10.00pm . Plans are in place to train people in our Pastoral Area (parishes of Lorrha, Borrisokane and Terryglass) as Leaders for Lay- Led Liturgies. This training course is open to all parishioners who would like to get involved and especially Readers of the Word, Eucharistic Ministers and Sacristans. It will be held on Monday evenings, commencing 11th March and will continue until 1st April (with the exception of Monday 18th March) in the Community Hall at 8pm and will be directed by Fr. Ger Nash and Maureen Kelly (Diocesan Pastoral Worker). Enquiries to Mary at 090-9747972 or 087 2601413. The death occurred of Teresa Madden at her home in Preston, England on Friday February 8th 2019, a few days shy of her 89th birthday. Nee Dowd from Ballymacegan, Teresa moved to England with her husband Frank Madden, Portland, in 1952 where she set up home, working tirelessly to provide for her family. A beautiful, kind, caring, loving lady with a quick wit and a cheeky smile, she was loved by all who knew her. Teresa is very sadly missed by her husband and best friend Frank, her adoring children Ellen, Patricia, Kathleen, Martin and John, her heartbroken grandchildren and great-grandchildren, sons in law, daughters in law, brothers in law, sister in law, nieces, nephews, relatives and friends to whom sympathy is offered. Teresa’s funeral Mass was held in Preston on Wednesday 20th February followed by burial in the adjoining cemetery. May her gentle kind soul rest in peace. Sympathy is extended to the Noel Killeen and family Rathcabbin and Killeen families Meelick on the death recently of their sister Frances (Fran) who died in England. Burial took place in England last week. May she rest in peace. 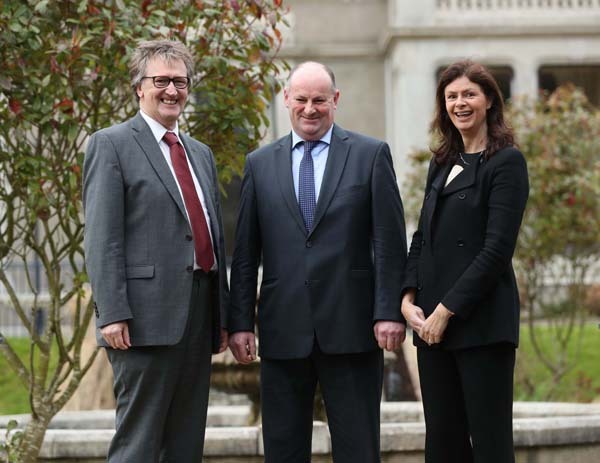 Following on from a very informative talk on Brexit held in Nenagh library last year, Professor Brian Lucey of TCD School of Business will re-visit this subject at The Source Arts Centre, Thurles on Tuesday, 12th March at 7pm. In a talk entitled ‘Brexit: An Analysis of a National Meltdown’, Dr. Lucey asks what happened and where do we go from here? Please note - This is a free event but pre-booking is necessary and can be done through the box office at The Source. This is an EDIC talk, part of Nenagh library’s Programme of Events 2019. Nenagh library is a Europe Direct Information Centre for counties Tipperary, Limerick, Cork and Kerry. There was No Winner of this weeks lotto jackpot of €10,050. Numbers drawn were: 8-13-26-32. No Match 3. Lucky Dips: Mary Brady, Nancy Gennery, Tommy Needham and The Poker Club. Next Monday's draw will be for a jackpot of €10,200 with a Match 3 pot of €120 so make sure you are in the draw. Thank you for your continued support. Senior Hurling: The seniors will be away to JK Brackens in the opening round of the County Hurling League Division 2 on Sunday 10th March in Templemore at 12.00pm. Minor Football: Lorrha Rovers Gaels fell to a 3-6 to 0-6 defeat to Moneygall/Clonakenny in the opening round of the North Minor 'B' Football Championship on Sunday. They now face Borrisokane in Ballinderry this Sunday at 12.00pm needing a win to stay in the competition. Under 14: Well done to the under 14's who defeated Shannon Rovers Gaels 4-3 to 2-0 in the first round of the Feile 'B' hurling on Sunday. They will play Moneygall/Clonakenny in the semi-final in Moatfield on Saturday 16th March at 3.00pm. Under 6, 8 & 10: Training starts on Thursday 7th March. Parents will be contacted in due course. All new players welcome so please contact Tommy Kennedy 0879191689. Tipperary GAA Clubs Draw: The March draw takes place this Friday night. Thanks to all our subscribers and we ask all promoters are asked to bring their accounts up to date with just two draws remaining. Membership: for 2019 is now due and is unchanged from last year. €90 – Adult player; €50 – Minor/College student; €30 – Non-playing Adult (+€70 extra for gym membership); €20 – Juvenile (16 & under); €90 – Family (2 adults & 2 children, capped at €100 for three or more children). Schools: Congratulations to Colm Fogarty and the Borrisokane Community College Senior Hurling team who progressed to the All Ireland 'C' final following a semi-final win over Kilcormac last Saturday. Social Dancing: in the GAA Centre on Friday 8th March with Pat Daly. Dancing 9.30pm to 12.30am. Rathcabbin Players are back on stage for four nights only with their re-scheduled dates from Thursday night February 28th to Sunday night March 3rd in Rathcabbin Hall with Jimmy Keary’s 3 act comedy ‘Better Late Than Never’. Doors open at 8.00pm with curtains up at 8.30pm sharp. 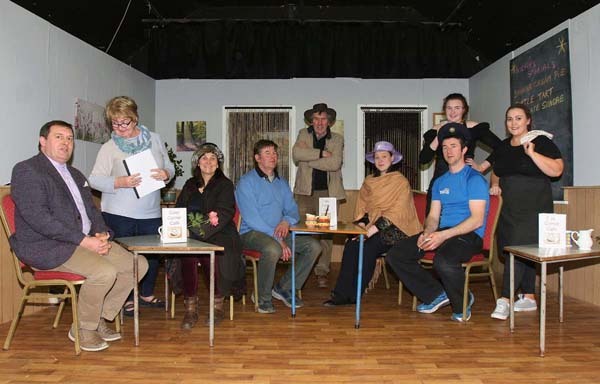 Booking line open on (087) 2360096 between 6.00 and 8.00pm.Pictured above are the cast and director. From left: Andrew Dagg, Marian Frawley (director), Teresa Ryan Feehan, Pat Kennedy, Mick Hoctor, Catherine Bourke, Eva Noyce, Tadgh Nevin, Fiona Kennedy. Sunday night’s performance is in aid of the Special Olympics. The North Tipperary Ploughing championships will take place on Sunday March 3rd from 12.30 on the lands of the Dennison family, Kilbarron by kind permission. Raffle tickets are on sale at present with loads of prizes and the draw will take place on March 23rd in Hannigan’s of Kilbarron. The next meeting will take place on this Wednesday night 27th Feb at 8.30pm in The Yanks Borrisokane and all members are requested to attend. If you haven’t by now booked your seat for Rathcabbin players re-scheduled 3 act comedy, then do so immediately on (087) 2360096 between 6.00 and 8.00pm. ‘Better late than Never’ which was written by Jimmy Keary and directed by Marian Frawley from Portumna will run for four night’s only commencing on Thursday night February 28th to Sunday night March.3rd. Not to be missed. Sunday night’s performance is in aid of the Special Olympics Ireland which takes place in Abu Dabi in March. Mass will be celebrated in Redwood Church on Saturday March 2nd at 6.30pm and in Rathcabbin the following day at 11.30am. Mass in Lorrha Church on Mondays at 9.30a.m. Sympathy is extended to Mary Cleary and family Rathcabbin on the death of her sister Chrissie McIntyre Kilcormac which occurred on Sunday 17th February. After funeral Mass in the Church of the Nativity of the Blessed Virgin Mary, Kilcormac on Friday morning last, burial took place in Rath Cemetery. May she rest in peace. Sympathy is extended to the family of Teasie Madden (nee Dowd) late of Ballymacegan who died in England last week. May she rest in peace. Sympathy is extended to the Bourke families Lorrha and Rathcabbin on the death of a sister and aunt, Nuals Bourke Campbell who died in England last week. May she rest in peace. Redwood NS is currently accepting applications for enrolment of Junior Infant pupils for September 2019. Application forms for enrolment are available from the school 8.30 am - 3.30 pm daily. If you would like to contact us, please call 090 9747186 or email redwoodns@live.ie. Visits to view the school, see the facilities and meet the teachers can also be arranged. Applications for enrolment will close at the end of February. Scoil Lua Naofa Lorrha is accepting enrolments for the coming school year. If you wish to enrol your child, please contact the school on (090) 9747295 or by email to luanaofa@eircom.net or forms can be collected from the school. There was No Winner of this weeks lotto jackpot of €9,900. Numbers drawn were 13-15-16-26. 1 Match 3 wins €100: The Cahalan Boys. Next Monday's draw will be for a jackpot of €10,050 with a Match 3 pot of €100 so make sure you are in the draw. Thank you for your continued support. The first round of the Seamus O Riain Cup is against Thurles Sarsfields on weekend 7-8 April. Junior Hurling: The junior league will begin in the coming weeks. Minor Football: Lorrha Rovers minor footballers will begin their championship away to Moneygall/Clonakenny on Sunday 3rd March in Moneygall at 12.00pm. Tipperary GAA Clubs Draw: Thanks to all our subscribers and we ask all promoters are asked to bring their accounts up to date with just two draws remaining. Referees Course: A Foundation Course for new referees will be held over three Monday nights starting next Monday, March 4th. It will be the only new referee course for the coming year. Anyone interested are to contact Philip Kelly, Referee Recruitment committee 0872863683. The club has no referee at the moment and needs to be addressed. Schools: Best of luck to Colm Fogarty and the Borrisokane CC senior hurling team in the All Ireland 'C' schools semi-final against Kilcormac this Saturday. Colleges: Well done to Michael Dolan who won an All Ireland Intermediate Colleges Hurling title with the University of Limerick last weekend. Social Dancing: in the GAA Centre on Friday 1st March with Declan Aungier. Dancing 9.30pm to 12.30am. Please note - This is a free event but pre-booking is necessary and can be done through the box office at The Source. This is an EDIC talk, part of Nenagh library’s Programme of Events 2019. Nenagh library is a Europe Direct Information Centre for counties Tipperary, Limerick, Cork and Kerry. Andrew Dagg, Marian Frawley (Director), Teresa Ryan Feehan, Pat Kennedy, Mick Hoctor, Catherine Bourke, Eva Noyce, Tadgh Nevin, Fiona Kennedy in final rehearsals for 'Better Late Than Never'. Anyone wishing to book a seat for Rathcabbin players re-scheduled 3 act comedy can do so on (087) 2360096 between 6.00 and 8.00pm. ‘Better late than Never’ which was written by Jimmy Keary and directed by Marian Frawley from Portumna will run for four night’s only commencing on Thursday night February 28th to Sunday night March3rd. Seats are filling fast, so hurry. Mass will be celebrated in Lorrha Church on Saturday February 23rd at 6.30pm and in Rathcabbin the following day at 11.30am. Mass in Lorrha Church on Mondays at 9.30a.m. Please note, when making a booking for Anniversary/ Month’s Mind Mass, Christening etc. you can contact the parish office by phone – 090 9747009 and leave a message or E Mail lorrhaparishoffice @ gmail.com (preferred options), you can also make bookings after Masses on Sundays or phone parish office on Wednesday nights 8.00 to 10.00pm . The North Tipperary Ploughing championships will take place on Sunday March 3rd from 12.30 on the lands of the Dennison family, Kilbarron by kind permission. Raffle tickets are on sale at present with loads of prizes and the draw will take place on March 23rd in Hannigan’s of Kilbarron. The next meeting will take place on this Wednesday night 20th Feb at 8.30pm in The Yanks Borrisokane and all members are requested to attend. There was No Winner of this weeks lotto jackpot of €9,750. Numbers drawn were: 2-3-16-28. 1 Match 3 wins €100: John Gorman (Portumna). Next Monday's draw will be for a jackpot of €9,900 with a Match 3 pot of €100 so make sure you are in the draw. Thank you for your continued support. Senior: The seniors will be away to JK Brackens in the opening round of the County Hurling League Division 2 on weekend 9-10 March. Lorrha's other league fixtures and dates are: 16-17 March v Ballina (home); 27-28 April v Newport (away); 5-6 May v Golden Kilfeacle (home); 26-27 May v Ballingarry (away); 9-10 June v Shannon Rovers (home) and 23-24 June v Mullinahone (home). Junior Football: Lorrha have entered the new County Junior 'B' Football Championship and will play Nenagh Eire Og in round 1 on 20-21 April. Galtee Rovers and Eire Og Annacarty are also in the group. Minor Football: Lorrha Rovers minor footballers will begin their championship away to Moneygall/Clonakenny on Sunday 3rd March. Medal Presentation: The Lorrha Rovers Gaels Under 15's who won the North 'B' Hurling Plate in 2018 were presented with their medals last Saturday night in Moatfield. Juvenile: Well done to Donnacha O'Meara who represented the club on the North Tipperary Under 15 Football team in the Mick Frawley Cup recently. Scor: The Area finals of Scor na bPaisti will take place in Portroe on Sunday 24thFebruary, commencing at 2.00pm. Anyone interested in taking part should contact a club officer. Social Dancing: in the GAA Centre on Friday 22nd February with Michael O'Brien. Dancing 9.30pm to 12.30am. As the title suggests, Rathcabbin Players will get back to perform this 3 act comedy and are busy back rehearsing with a slight change in the character roles. Written by Jimmy Keary and directed by Marian Frawley the play will go ahead for four night’s commencing on Thursday night February 28th to Sunday night March.3rd. The group extend a speedy recovery to Hubert Hogan who played the part of Emmet in the play. Andrew Dagg takes on that part while Tadhg Nevin will step into the role of Garda Doyle which was played by Andrew previously. The booking line will be open from next week, watch this space for full details. Mass will be celebrated in Redwood Church on Saturday February 16th at 6.30pm and in Rathcabbin the following day at 11.30am. Mass in Lorrha Church on Mondays at 9.30a.m. Bereavement Support Information Evening will be held on Tuesday 26th February 2019 from 7 to 8.30 pm. This is one of the quarterly information evenings that are held throughout the year to provide information on normal grief and the support services offered by Milford Care Centre. Anam Cara & Milford Care Centre Bereavement Information Evening on Thursday 28th February 2019 from7 to 9.00pm Milford Care Centre and Anam Cara, the national organisation that provides support services to bereaved parents and families, are hosting a Bereavement Information Evening in Limerick. This event gives parents an opportunity to hear an experienced bereavement professional talk about the many challenges their family may face after the death of a son or daughter. Please note this event is open to all bereaved parents, regardless of the age of their child or the circumstances of their death. If you have attended a previous Bereavement Information Evening, we would encourage you to come again because each time you will hear something that will help you along the difficult and challenging journey of grief. There will also be time after the talk to interact with other bereaved parents. The Information Evenings are Free. The results from the recent Rathcabbin Hall raffle is in 1st place Ailise Lawyer, 2nd. Carmel O’Connor (Birr) 3rd. Sinead Dermody (Rathcabbin). The draw was a great success with all tickets sole. The North Tipperary Ploughing championships will take place on Sunday March 3rd from 12 noon on the lands of the Dennison family, Kilbarron by kind permission. Raffle tickets are on sale at present with loads of prizes and the draw will take place on March 23rd in Hannigan’s of Kilbarron. The next meeting will take place on Wednesday night 20th Feb at 8.30pm in The Yanks Borrisokane and all members are requested to attend. There was No Winner of this weeks lotto jackpot of €9,600 Numbers drawn were: 1-5-15-32. 3 Match 3's share €100: Ciara Maher, Cyril Lowry & Houlihan family (Lorrha). Promoters: Louise Mannion, D&K Mannion and Gavin Young. Next Monday's draw will be for a jackpot of €9,750 with a Match 3 pot of €100 so make sure you are in the draw. Thank you for your continued support. Senior: Lorrha have been drawn in group 2 of Division 2 in the County Hurling League along with Mullinahone, Newport, Ballina, Ballingarry, JK Brackens, Golden Kilfeacle and Shannon Rovers. First round game to be played on weekend 9-10 March. Under 21 Football: Hard luck to the Lorrha Rovers Gaels Under 21 footballers who were defeated 3-9 to 2-5 by Kilruane MacDonaghs in the quarter finals of the North 'B' Championship in Ballinderry on Sunday. Medal Presentation: The Medal Presentation for the Lorrha Rovers Gaels Under 15 Hurlers that won the North 'B' Plate last year will take place in Moatfield this Saturday evening at 6.30pm. All are welcome. Schools: Congratulations to Colm Fogarty and the Borrisokane Community College Senior hurling team who won the Munster 'C' final on Saturday. Tipperary GAA Clubs Draw: Unfortunately we had no winner in the February draw which was held last Friday night. Thanks to all our subscribers and we ask all promoters are asked to bring their accounts up to date with just two draws remaining. Referees Course: A Foundation Course for new referees will be held over three Monday nights starting on March 4th. It will be the only new referee course for the coming year. Social Dancing: in the GAA Centre on Friday 15th February with Larry McEvoy (replacing Finbarr Dennehy). Dancing 9.30pm to 12.30am.